Another facet of Sister Maria de Jesus of which it has been widely written and, it has been subject of long lectures and debates, is the one of Adviser, specially, the one that exerted in favor of king Felipe IV, but it is not limited to this personage only. On July 10, 1643, in Ágreda appeared, for the first time, the king of Spain, Felipe IV. Maria Colonel Arana was 41 years old, and the King had become detached few months ago, from the valued Count-Duke de Olivares who by space of 20 years had directed all his policy. Because of the revolt of Catalonia, the King was itself forced to visit the scenes of the war; and it is thus, as in route to Zaragoza he wanted to turn aside to Ágreda to know Sister Maria. After the historical meeting, begins a deep esteem and friendship between the king and Maria de Ágreda that it would have for her, the sense of an apostolic responsibility of new type. In effect, from the first moment, Sister Maria assumed the weight of a singular supernatural protection on the Spanish real house. Felipe IV leaves saying Madre Ágreda that she was writing him: “He passed by this place and entered to our convent king our Lord, on July 10, 1643, and he left me commanded that I should write to him”, Sister Maria wrote. This epistolary correspondence will last 22 years, until the death of Maria de Ágreda (1665). They were 618 letters between both altogether. The first letter written by Sister Maria has been dated on July 16; and first of the King on 4 October, 1643. In the first meeting the Abbess spoke already to the king of the Mystical City of God, because she was writing up the first version of the same one. Then, on April 19,1646 again passed for Ágreda the Sovereign with his son, prince Balthasar Carlos, and after the death of this one, he passed for a third and last time, to visit Sister Maria, on November 5 of he same year. “She remained (Sister Maria) foreign to any intrigue or personal interference in political events, despite the facilities that offered to her the circumstances, and on the attempts that to use her influence on the spirit of the King, in more than an occasion, friends and close friends discover. And it is that for Sister Maria her main mission was to encourage the King, as well as to strengthen the will and the conscience of the Sovereign and, of course, it moved to her the zeal for saving the soul of Felipe IV and of all the Monarchy. It could not have deceit of heart in her. In addition to the Spanish royal house she got in touch with the nobility of European countries like France, Germany, Italy and America. 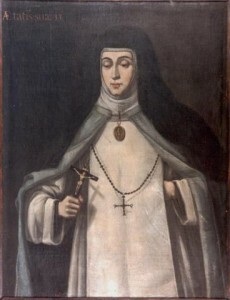 Sister Maria de Jesus also maintained correspondence with the Virrey Don Fernando de Borja and other high personages of Zaragoza and Aragón. The Pope Alexander VII was well recognized by the letter that he directed to her. The Nuncios of the Holy See Julio Rospigliosi that later became Pope Clemente IX, personally visited Sister Maria, of whom he was a sincere admirer. Bishops, archbishops, cardinals, were correspondents or spiritual confidants of her. Theologians used to go to her and until the General of the Order of the Mercy. But, Sister Maria de Jesus was not only confidant or adviser of important personages. To the entrance wheel of her convent were approaching all type of people, poor men, needed, women, paupers, etc., none of these people approached moved away without a consolation, without a word of breath without a spiritual or material help from our Mother Ágreda, because the charity was her main virtue and the zeal by the poor men and the needed ones, her flag. And it is that this woman is as she herself says: “one infuriates servant of the Lord” who only deserved to serve her Holy Creator.